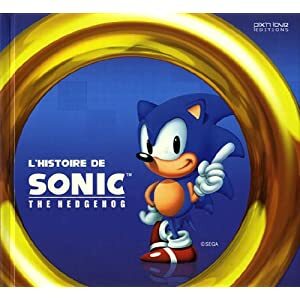 History Of Sonic Book Amazon UK Change Indicates A Go… But Why Is The French Version £10 Cheaper? Home » News » History Of Sonic Book Amazon UK Change Indicates A Go… But Why Is The French Version £10 Cheaper? We’ve waited patiently for the English version of Pix ‘n love and Udon’s History of Sonic encyclopaedia, the chunky 300 page opus would be on many a Sonic fan’s Christmas list… were it not for the fact it was being released on Christmas Day itself in the UK. Which is a bizarre business decision frankly. In any case we’ve heard from fan Lee Jackson on Twitter that the Amazon listing for the History of Sonic has undergone a slight change, before this week displaying “sign up to be notified when available” it is now available to pre-order. Good news. There is one question I’d like to ask. The May released French version L’histoire de Sonic is currently on Amazon for £22.57, whilst the English language version will be £32.29 from launch and even that is reduced from a RRP of £37.99. Why is there a £10 for the same product in another language? That’s quite a chunk of change. Reasonable for a six month gap or unreasonably harsh on the English fans. What do you guys think? Let us know in the comments below. The idea behind it is undoubtedly brilliant, but the companies responsible for their production stay taking attitudes that I simply can not understand. It seems that they themselves do not want the book to be a success. PS: Sorry but I don’t speak (or write) English very well.